Congratulations on accepting an offer on your property in NYC! As a next step in the NYC FSBO Closing Process, you will need to prepare and circulate a deal sheet (transaction information sheet). In this article, we explain how to prepare a deal sheet and provide a sample Excel deal sheet template for you to use. If your buyer is working with a buyer’s agent, then as a next step the buyer’s agent will ask for the listing agent to circulate a deal sheet (transaction information sheet). The deal sheet itself is a simple Excel or Word document which contains a non-binding summary of the agreed upon deal terms, some basic information about the building and unit as well as the contact information of the various stakeholders in the deal including both buyers, both attorneys, both brokers as well as the building’s managing agent (managing company). If you are managing the sale process as an Agent Assisted FSBO, you will be tasked with assembling the deal sheet on behalf of the listing agent. 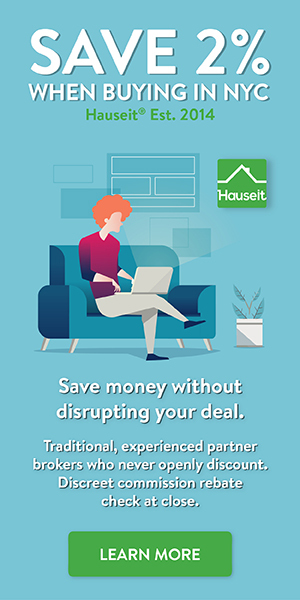 If you are working with a discount, full-service listing agent then you can expect your listing agent to prepare and circulate the deal sheet on your behalf. Before you can prepare a deal sheet, the buyer’s agent will need to provide you with contact information for the buyer, buyer’s real estate broker and buyer’s real estate attorney. We explain the requirements of a typical NYC deal sheet in the paragraph below. What information do I include in a deal sheet? 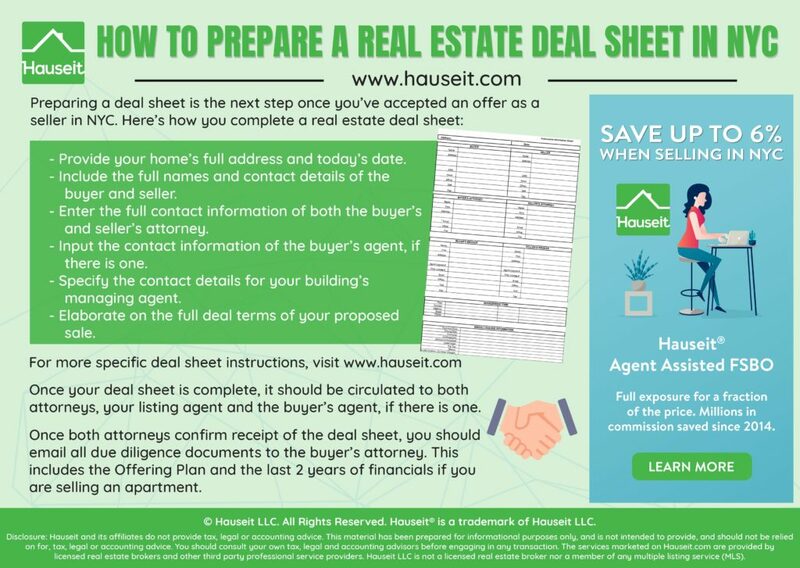 More specifically, your typical deal sheet will ask for the following information about the buyer and seller: name, current address, social security number, email, contact phone and fax number. Please note that you will need to ask the buyer’s agent for the relevant contact details of the buyer. Kindly note that if the buyer’s broker does not provide his/her client’s social security numbers, you can simply indicate ‘to be provided by attorney’ on the deal sheet itself. The following attorney contact information is also required: attorney name, firm name, mailing address, email, office phone and fax number. A typical deal sheet will also include the contact and firm details of each broker involved in the deal, including the following: agent name, firm name, firm address, agent license number, firm license number, email, office phone, cell phone and fax number. Because the building’s managing agent will always be involved in some facet of the closing process, a deal sheet will also usually include the name of management firm’s ‘closing agent’ as well as his or her contact address, email and phone. A critical element of the deal sheet is the agreed upon consideration (price) for the property. Please note that if your sale price also includes other items such as parking, you should list that in this section. If the buyer or seller have any particular stipulations regarding a closing date, you should include that here. Otherwise, it’s fine to list ‘standard 60-90 days’ for a financed deal or ‘standard 30-60 days’ for an all-cash and/or non-contingent deal. If your buyer is financing, please list the percentage down that that the buyer indicated on his/her offer or final deal terms. If you are including or excluding particular furniture or other items from your sale, please list that information here. For the section in the sample Deal Sheet regarding commissions, feel free to only mention the commission paid to the buyer’s agent. For example: “Commissions: 3% to City Realty.” This way, you can help preserve the full-service reputation of our affiliate broker. There’s no legal obligation to disclose on a Deal Sheet or otherwise to the buyer’s agent what commission our affiliate broker is making, as this is a private arrangement between you and your listing agent! In the case of a co-op, please include in this section the building’s flip tax. Co-op flip taxes can either be a percentage or a per-share dollar amount. Please indicate the number of shares in the co-op assigned to your specific building. Under this section please list the monthly maintenance figure (for co-op) or the monthly common charge amount in the case of a condo. If you are selling a condo, townhouse or other property, please list the monthly real estate taxes in this section of the deal sheet. If you are aware of any forthcoming building assessments, please list them here. Brokers who prepare deal sheets simply complete and send the following template. How do I send a deal sheet? Once you have completed the deal sheet, please send it to your listing agent for review. He or she will review it for completeness and then circulate it on your behalf to both attorneys, the buyer’s agent as well as yourself. Once the deal sheet has been circulated, the attorneys will make contact with each other to commence the due diligence and contract negotiation process. The seller’s attorney will usually begin preparing a draft of the contract for sale (and contract rider) while the buyer’s attorney will work on procuring diligence documents (offering plan, building financials, etc.) in order to begin conducting due diligence. As things progress, you can expect your attorney to make contact with you in order to more thoroughly explain next steps as you move towards a fully executed contract and closing. What does a sample Deal Sheet look like?